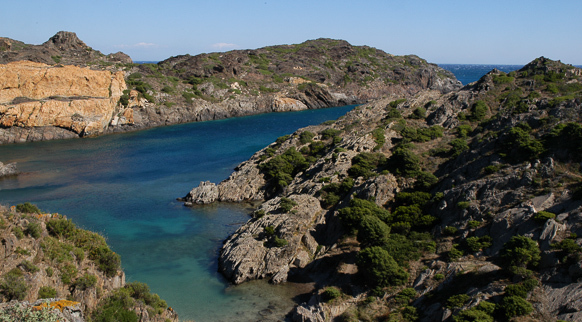 In the north of the Costa Brava you’ll find one of the natural wonders of the counties of Girona, the Cap de Creus Natural Park. It contains a collection of beauty spots that will leave a lasting imprint on your memory. You won’t forget the views of the wild coastline with its vertiginous cliffs and hidden coves, and with islets scattered all along it. Neither will you forget the capriciously shaped rocks, sculpted by the wind and the erosion of the sea; with a little imagination you’ll be seeing lions, dragons, camels, eagles and other figures. You’ll also treasure the memory of the park’s interior, a biological paradise of forests and meadows that you can explore on endless excursions, stopping off in the peaceful towns of Llançà, El Port de la Selva, La Selva de Mar, Cadaqués, Roses, Palau-saverdera, Vilajuïga and Pau.